Adding content youtube into post articles often make us hassle to show the youtube video at the center position. By adding youtube content into articles can improve your website SEO ranking. But often the youtube iframe can’t appear in the right position so the embed video display becomes unattractive. Maybe you are a new blogger and do not understand about CSS feel frustrated when you want to put the video on your WordPress site. 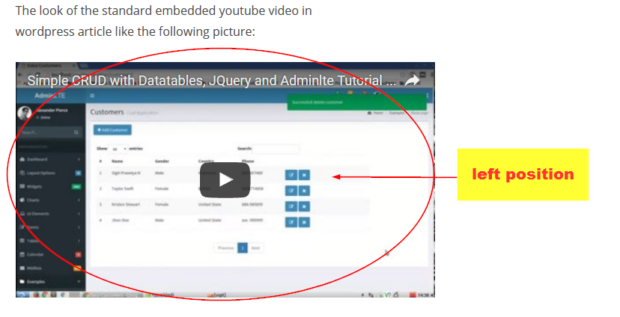 The image above shows that the youtube video I embed are not in the middle position and looks unattractive layout. I will share a short trick to help you in setting the video embed position to be in the middle of your article content. And the result of the installation of the above code makes the video in the right position now, that is in the middle. You can’t center the video by clicking the “align center” format button on the WordPress “visual editor” tab but still have to add the div element code using the manual on the “text editor” tab. And the results become as shown below. Above is a way to install embed video in center position and set the full width video on WordPress, hopefully this simple article useful.